Happy Swiss Day everyone! Once again the weather has been kind and the rain has not only kept away, but there isn’t a cloud in the sky! My day started early for the Scout breakfast – never before have I had breakfast with 2000 people in a disco atmosphere with a fitness class! It certainly got us started in the right spirit for the rest of the day. From there I took a stroll into the town to get a feel for the day – there are flags everywhere and everyone is dressed up in red and white – there really is a great feel of celebration. 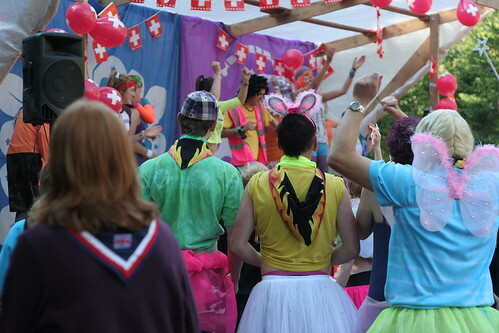 After lunch it was the KISC carnival. A number of groups had stands selling flags, swapping badges, traditional food samples from their area and so much more. There were games of giant table football, tug of war, a very English game of cricket and even a talent show! (there was some very special talent on show – Simon Cowell watch out!) Everyone looks like they have had a great time. This however, is only the start. This evening the Swiss flag will be para-glided in, there will be music and dancing along with a fireworks display. All that, not to mention the parade which will contain all the Guides and Scouts marching into town – I can’t wait!